The fall is my favorite season of the year! Once September hits I start to transition mentally to the flavors of pumpkin and eerie aesthetics. The bucket list is not an obligation, it is an inspiration. I’m free to change it as I go. After reading this list, why not make one for yourself? 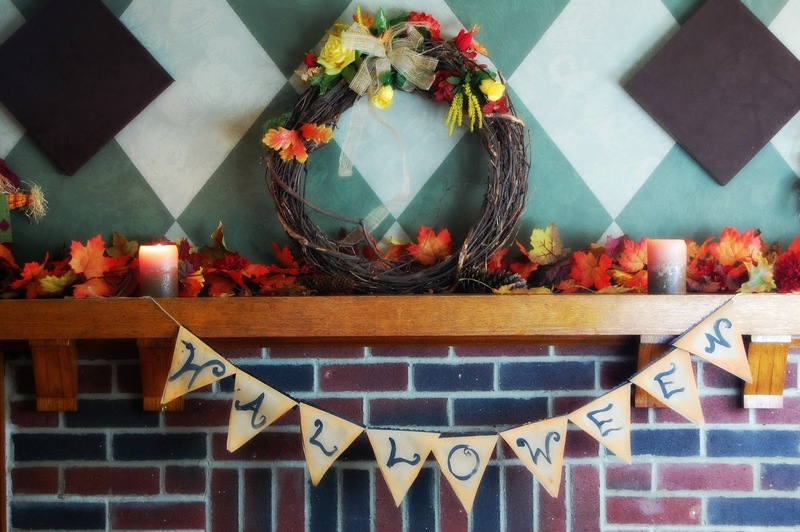 Decorate mantel in living room for the fall / Halloween. With regard to decorations, I like to keep things simple. That’s why having two main focal points in the home (or one’s apartment) is a fantastic solution. Pinterest in my go-to spot for inspiration! Using streamer, candles, decorative leaves and lanterns. The mantel top was arranged by my husband Sage and includes a few natural fall leaves which he preserved using Mog Podge. One side benefit of enthusiastically doing DIY projects or decorating the home, is that the whole family has gotten involved. My husband and two children have all made wonderful decorations including window silhouettes. When I do my bi-weekly shopping (twice per month) I stock up on banana’s which I freeze. Usually buying 8 bunches. These are the base for excellent smoothies, making ice irrelevant. I prepare these with pumpkin puree, frozen banana’s, pumpkin spice, milk, vanilla and a touch of evaporated cane juice. This icy beverage has nutritious beta carotene and the banana’s aid in concentration. No need to buy an energy drink from a smoothie shop, you’ll feel a natural buzz that will energize you for hours! Serve in small iced mason jars decorated with jack-o-lantern faces and you’ll have a crafty beverage. 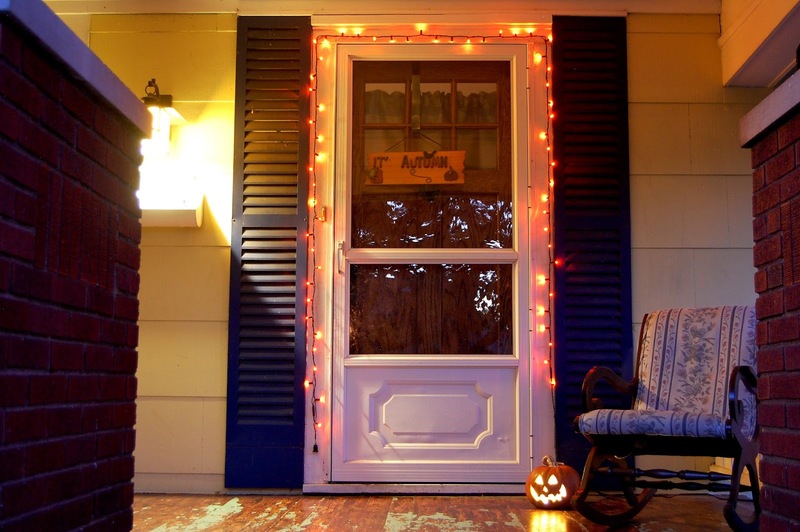 Decorate front porch for fall / Halloween. Decorating the front porch during the fall is one of my favorite events. This year I placed orange lights around the perimeter of the front door, which I lightly secured in place with a few small nails. A large pumpkin sits to the side of our antique country rocking chair. Behind the glass door hangs a sign stating “It’s Autumn” and a home-made banner with the words “Boo” created by my son. It announces to passers by that the season is in full effect. The porch as a focal point is perfect for today’s lifestyle minimalist. By limiting the exterior decor to the porch, there is no need to feel the urge to buy inflatable yard decorations or elaborate scenes. If you are inspired to further decorate try your hand at classy window silhouettes. 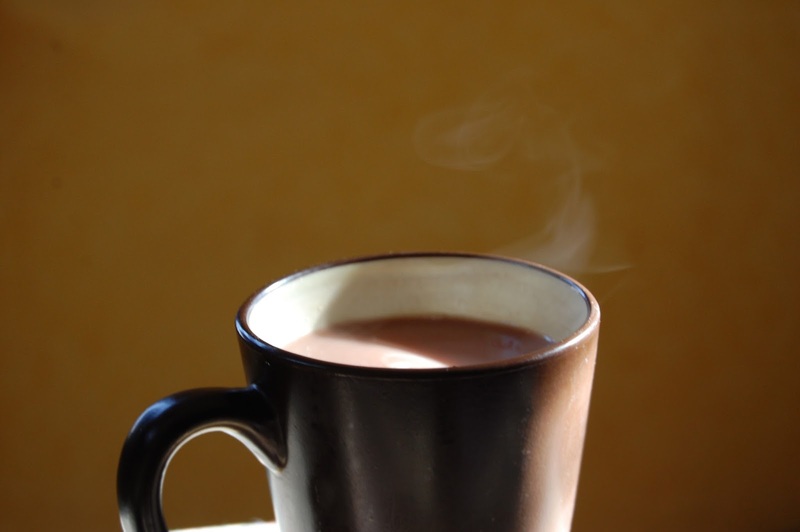 Our local chocolatier, Debrands Chocolate makes the most decadent hot caramel drink. The idea seemed novel to me, so I ventured to make one of my own at home. I prepared home-made caramel, melted it with warm whole milk and topped with homemade whipped cream. Truly amazing! If you are daunted with the idea of making it from scratch (and who can blame you!) there are wrapped caramels that you can melt into warmed milk. Caramel sauce in a container could be your third option. Of course you can spray on canned whipped cream. You can up-cycle nice looking over sized mason jars for a beautiful DIY project. You usually need mason jars, color spray such as Krylon Shimmer Metallic Spray and a Fine Tip Black Paint Pen. Though I did my own take on the project by painting the jar by hand. I did a color gradient of black fading to orange then yellow as a base. Next I free handed the picture on a piece of paper rather than print out stencils. Some tutorials have you trace the drawn image onto the jar with a black paint pen or fine paint brush. Because my painting base was very opaque I instead cut out the silhouette, then traced it’s edges onto my jar. Next I painted in the details. 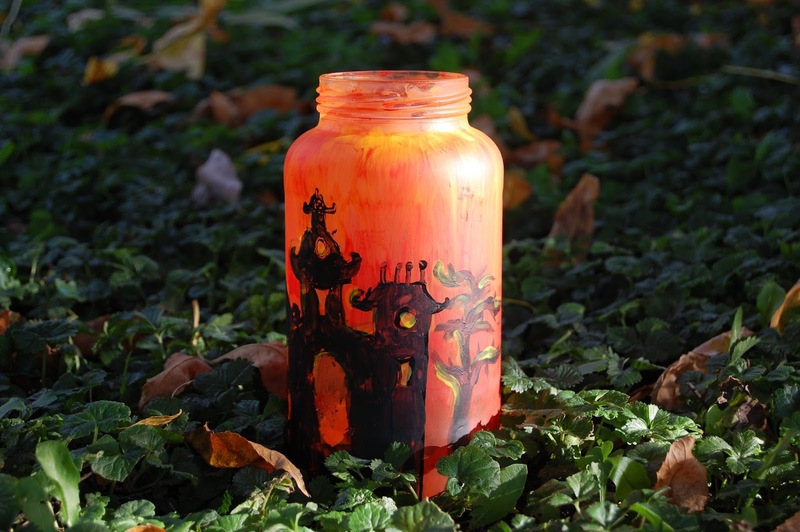 Google images has a lot of inspiration and simple lines from which to get ideas when creating a Halloween jar silhouette. When it comes to craft tools my goals is to simplify the tools needed, adapting the technique. This is not only apart of the minimalist lifestyle, it is how people lived centuries ago. Get inspired! Go on a sunset bike-ride or walk to view decorations. I’ve started an annual tradition of viewing my neighbors festive displays via bike ride. The cool autumn breeze, glowing Halloween lights, flickering Jack-o-lanterns, front doors dressed in golden fall wreaths, and spooky displays are a wonder to take in. Plus sticking with a fitness lifestyle will help you to stay trim throughout the upcoming Holiday season. I often have 3-5 different routes I take so I can view different parts of the neighborhood. A brisk twilight hour walk is another way to take in the atmosphere. Time passes very quickly if we don’t stop to take in seasonal moments. A Holiday celebration is so much more than the day itself, it’s the season! 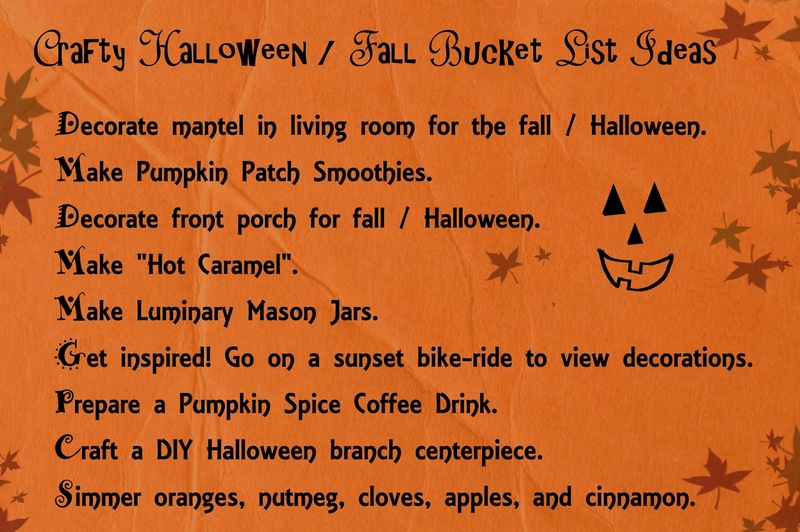 Prepare or Buy a Pumpkin Spice Coffee Drink. There are many enthusiasts who kick off the fall season with their first Pumpkin Spice Latte. I enjoyed one from Barnes and Noble in our local mall at Glenbrook Square. While browsing the shop I took in the inspirational ambience and picked up a Christmas gift to stow away. Of course I recommend making your own pumpkin spice coffee drinks at home on other days. Craft a DIY Halloween branch centerpiece. This is a simple DIY (Do It Yourself) craft, which can be adapted for Thanksgiving and Christmas. Most people use spray-paint, yet I like to use methods from the older world as much as possible. I start by gathering a selection of slim twigs. Next I lay them down on paper as I paint the surface with black acrylic paint. After completing each branch I sprinkle on a dusting of fine silver glitter. Once the branches have dried I arrange them together in a vase or mason jar and fill with pebbles. There are a few optional finishing touches such as wrapping a ribbon or lace around the perimeter. You can also draw and cut out bats or crows which are placed within the branches. The first time I became aware of the practice of simmering scents, the idea seemed like a revelation. I was on a holiday home tour when I thought surely someone must be baking apple pie! The scent came from the kitchen. Though I was disappointed there were no treats to sample, I was fascinated by the concept. A pan simmering oranges, nutmeg, cloves, apples and cinnamon could create the most wondrous fragrance. It gave one an immediate sense of calm and homeyness. Enjoy the wonderful of the fall!